Presenting approximately 200 works, including posters, drawings, paintings, decorative works, as well as books and photographs, Alphonse Mucha: Art Nouveau and Utopia will highlight six aspects of Mucha: as a Bohemian in Paris; the creator of ‘le style Mucha’; a cosmopolitan; a mystic; a patriot; and an artist-philosopher. Through these aspects, the exhibition at the Hangaram Art Museum will show the development of his career and how he grew as a man, living through one of the most tumultuous times in European history. The exhibition at the Hangaram Art Museum traces the influence of Mucha’s Czech roots and his passionate love of his country on all aspects of his career, from the early pamphlets and illustrated magazines in support of patriotic organisations in Ivančice, through the lean times living as an outsider of the French establishment in Paris and the years of celebrity following his breakthrough poster Gismonda for Sarah Bernhardt, and during the years spent in the preparation and fulfilment of his masterpiece The Slav Epic. It examines the way in which Mucha’s love for his homeland and Utopian ideals are manifested throughout his artistic career in all his work. And it demonstrates Mucha’s belief in the universality of art and its power to inspire and communicate with people and his vision that through the power of art he could work towards the spiritual union of the Slavs and, eventually, all mankind. 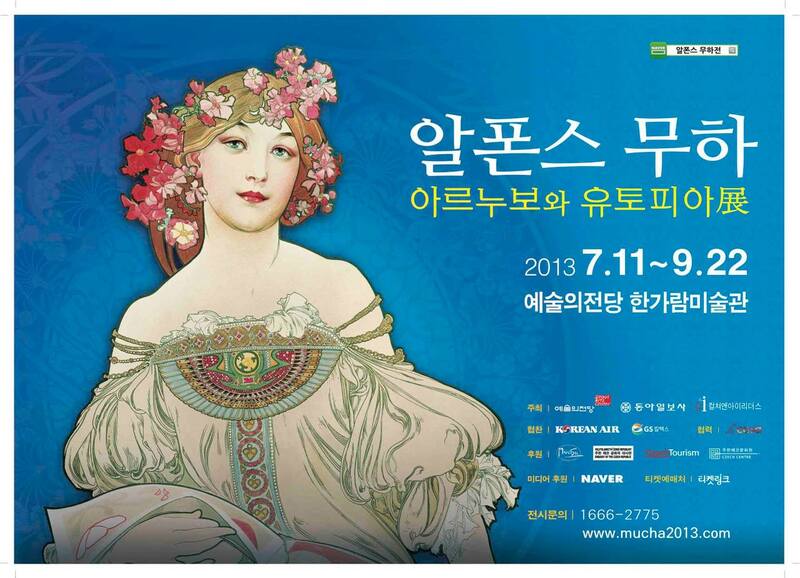 This first Korean Mucha Exhibition will be arranged thematically in six sections. The installation will be accompanied by a large-screen projection of The Slav Epic cycle (1911-28), as well as an interactive display of a selection of illustrated books.